How to make Moroccan Ghriba (Ghoriba or Ghriyba)? 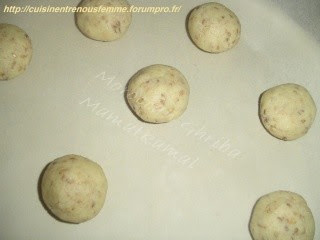 Comment préparer Ghriba (Ghoriba ou Ghriyba) Marocaine? Moroccan Ghriba (Ghriyba or Ghoriba), is very delicious round cookies, tasting very much like the Scottish Shortbread Cookies, but with a much crunchy texture, raised with baking powder and made of a combination of lemon, orange zest, almonds, cinnamon, orange blossom water and other ingredients which are common in Moroccan Cuisine, creating an uncommonly refreshing flavours. 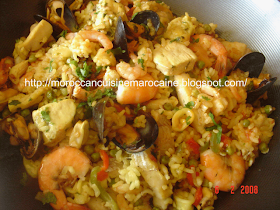 Ghriba in the Moroccan language (Darija) means "The Mysterious", and it was introduced to Moroccan Cuisine by a group of Andaloussi, who had settled in Spain, then fled to Morocco a long time ago. Actually, Ghoriba is popular all over the Kingdom, but the best one is to be found in the City of Fes, where to taste the most exquisite and the most delicious Ghoriba like nowhere else! Ghoriba is such a special treat for an afternoon snack or a wonderful tea cookie or little bite for a dessert. The most popular Ghriba in Morocco is the "Almond Ghriyba", also called "Chewy Almond Moroccan Macaroon", and it tastes absolutely delicious and great with a glass of mint tea! In Morocco Ghriba Recipes are given from generation to generation but you can always create your own version, whilst trying out new recipes. In general, making Ghriba is quite easy and you will soon find the process becomes second nature and you will not even need a recipe to make Ghriba, using your favourite flavours. However, it is worth paying attention to a few basic principles, I've given below. All my recipes of Ghoriba are step-by-step instructions and the first few times you are baking Ghoriba, try to follow those instructions until you are really familiar with the whole process. 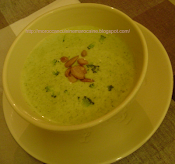 There are so many different types of Ghoriba and they are easy to make if you have all the ingredients in hands. In general, Ghriba is shaped by hand to form small or medium balls, then it raises during baking and cracks! 1-Ghoriba Bahla which means = Foufolle. This name was given to it because of its cracks which makes it look like a cookie with a big "smile" on its face! 2-Ghoriba Dyal Zite which means in Moroccan Language (Darija) = Cookies made with oil. 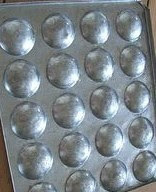 If you can, bake your Ghriba on a special mold, see pecture below. 1-Don't add too much flour, this will cause your ghoriba to be too dry and thus will crumble. Always put less flour as much as you can, and add more oudy (oudi), which is a preserved butter version for Imazighen-Swassa or add smen har (sman 7ar), which is a preserved butter version for Moroccan-Arabs, or simply add butter (real one and not margarine). 2-When you use oudy (oudi) or smen or butter, they should be soft and not liquid. Refrigerate them for a few hours before adding them to the dough. 3-Be careful not to mix too much ghriba dough or over-knead it. It is a biscuit and not bread, and you still want some lumps of oudy or smen or butter to create a nice texture for your ghriba. 4-Don't overcook ghriba. In general, 10 to 15 minutes should suffice to cook ghriba, since it contains no raw eggs or any other ingredients that need long cooking time and all the nuts or seeds used in the dough are usually grilled or roasted. Ghriba should remain very tender and, it is known in Morocco as a "melt in the mouth sweet". If you overcook it, it will become too crisp and dry. A perfect Moroccan ghriba should have a pale colour and should not be crisp. Enjoy the experience of Moroccan Ghriba if you try it one day, and to taste it, needless to say, with a sweet Mint Moroccan Tea! If I don't have the mold, is there anything else that I might use? What about a florentine pan?